K-pop heavyweights Big Bang finally reached Malaysian shores for their first-ever concert here held Saturday at Stadium Merdeka, with over 15,000 fans – or VIPs, as they are known – refusing to let the rain dampen their spirits. The weather eventually swayed to side Malaysian Big Bang VIPs though, with the rain stopping right before the curtains fell to reveal 5 futuristic tubes containing each member. The crowd went mad with squeals and screams as they began singing “Still Alive”. G-dragon, T.O.P, Taeyang, Daesung and Seungri did not fail to deliver as they performed their songs such as Fantastic Baby, Stupid Liar, Café, Monster, Blue, Gara Gara Go, Lies, Haru Haru and many more. 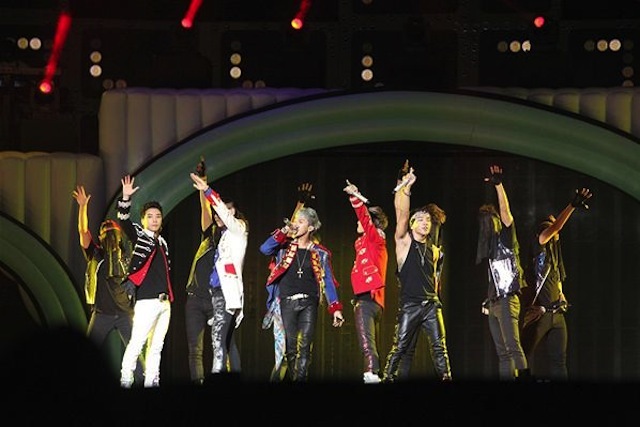 Aside from their energetic performance, Big Bang had great connection with the crowd. At one point, Seungri even taught the ‘Fantastic Baby’ dance moves, telling his VIPs that the dance was akin to moving like a car wiper. Fans enthusiastically followed his moves as he beatboxed a tempo. Without a doubt, Big Bang fans that turned out have deep feelings for the boy group as they raised their banners and sang a birthday song to T.O.P. It was certainly an enchanting experience to witness a stadium of 15,000 fans singing ‘Happy Birthday’ in unison. Seungri performed Strong Baby, Tae yang Performed Wedding Dressand Look at Me and Dae Sung performed Wing. Malaysian fans proved that language was no barrier as they sang along word-for-word with the boys. Big Bang also learned some Bahasa Malaysia for the occasion and even rapped an entire song with lines like, ‘Aku cinta padamu’, ‘Malaysia cantik’ and so on. Towards the end of the concert, the crowd cheered so loudly and enthusiastically that they decided to do an encore and they generously did 4 encore songs: Bad Boy, Fantastic Baby, Feeling and Hands Up. Dae Sung wrapped up the spectacular night and wished the crowd “selamat tidur”, though he probably meant ‘selamat malam’. As Big Bang left the stage, Malaysian fans showed their undying adoration for the boys with loud cheers as they reveled in an unforgettable evening.